The word “innovative” isn’t usually used in the same sentence as Washington D.C., but that adjective is surprisingly apt today. The nation’s capital has flown under the radar to become one of the leaders in transportation innovation. Recently launched services such as Uber, Hailo, Capital Bikeshare, Hitch, and RidePost are changing the way Washingtonians get around. 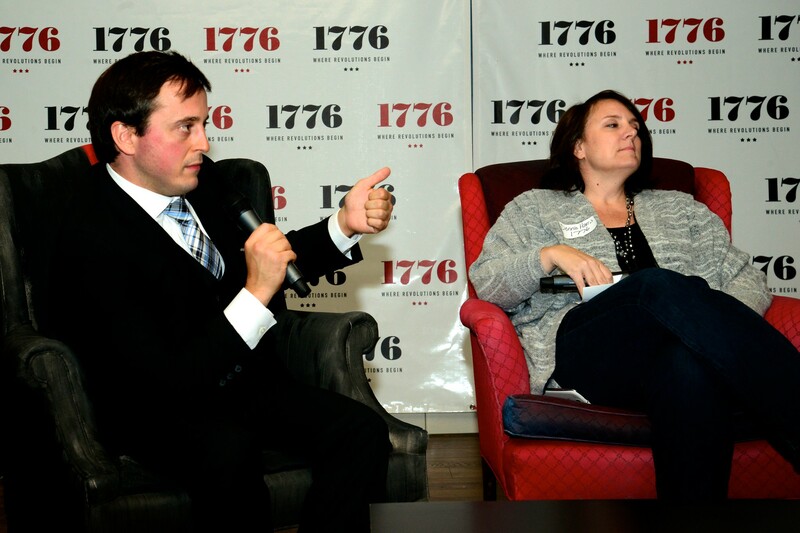 The proliferation of these new apps and services was the topic of the evening at “Transportation in the City,” a panel discussion hosted this week at 1776 by Smart Growth America and Elevation DC. Why D.C., and why now? These were two of the questions posed at the event, which drew a standing-room-only crowd of hipsters, geeks, and wonks in 1776’s swank industrial meeting space. First of all, Washington D.C. is a “big but manageable” city, stated Donna Harris, co-founder of 1776. With a population of 600,000 that swells to almost twice that on any given workday, D.C. is also a city with the highest number of commuters, according to Harris. D.C. is also a city with a transit system that is mature, but taxed to capacity. Harris said the opportunities inherent in our city made the transportation industry “ripe for disruption” by apps she refers to as “regulatory hacks.” Startups seized on opportunities present in an industry many view as too large, cumbersome, inefficient, and overregulated. And the consumer is now benefiting with more transportation choices than ever before. A demographic shift is also under way in the nation’s capital. Ilana Preuss, vice-president and chief of staff of Smart Growth America, said that D.C. is now the biggest employer of recent college grads. These Millennials – many burdened by school debt and high rents – are making an active decision to forego the automobile as an unnecessary expense. Fairchild echoed this sentiment by pointing to the forward-thinking work Arlington County did in the 1970s to locate its metro stations under Wilson Boulevard rather than I-66. Di Caro, too, spoke of the importance of tying land use with transportation. With even notoriously congested Tysons Corner making the decision to ditch its parking lots, things are changing for the better. Stewart Schwartz, director of the Coalition for Smarter Growth, points to the innovation of transportation-oriented startups as part of a larger trend in D.C. towards increased livability and revitalization that has only accelerated in recent years. The term “walkability” is thrown around so often in D.C. nowadays that it’s almost become a cliche, and the movement is spreading. Transportation apps and platforms are but one symptom of this movement. Equity remains an issue that still needs to be addressed, however. Transportation startups are dependent in large part on the proliferation of social media, and especially smartphones. Gentrification in D.C. remains an enormous problem, Di Caro acknowledged, and this is a thorny issue a smartphone app can’t ameliorate. Fairchild intimated that the equity issue is more pernicious and pervasive, noting not only that transit benefits are typically made available only to salaried, rather than hourly workers, and also the requirement to tie bikeshare memberships to credit cards. Harris closed the event by stating that “data is empowering.” Opening up data and making it available to all will show “dark spots on the map. Data drives transparency which drives decision making.” A positive view, to be sure. And hopefully an idea and trend that will spread throughout the region. Story photo by M.V. Jantzen on Flickr.